Pomegranate is a wonderful fruit in terms of taste as well as health. It contains a number of jewel toned seeds that can simply be munched on or juiced. The juice is as beneficial as the fruit itself. It is packed with vitamins and antioxidants and allows for quick and easy assimilation of the nutrients in the body. The antioxidant power of this ruby-eyed fruit is three times more than that of green tea and red wine. It contains antioxidants anthocyanins, ellagic and gallic acids, tannins, and quercetin. A single pomegranate can provide you with 40% of the daily requirement of vitamin C. Moreover, this fruit is a good source of vitamins A, E and K, and folic acid, calcium, iron, phosphorus, etc. 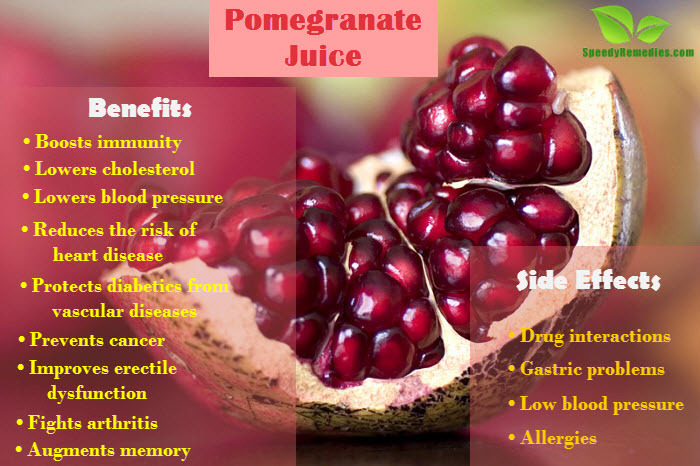 Discussed below are some benefits and side effects of pomegranate juice. As already mentioned, pomegranate juice is an excellent source of vitamin C. Hence, it boosts immunity and fights infections such as common cold, staph infections, bladder infection etc. due to its antimicrobial properties. Being rich in antioxidants, it stimulates blood cells to fight infections and eliminate toxins. It also improves circulation and is considered good for prenatal care because it has a high iron and folate content. Folate, or folic acid, is essential for the healthy development of babies. Pomegranate juice has antioxidant compounds called punicalagins that help lower blood cholesterol levels. These compounds also benefit the heart and blood vessels. It also helps reverse LDL oxidation, slows the buildup of cholesterol in the arteries, and works as a natural blood thinner. Studies have shown that in addition to lowering cholesterol, pomegranate juice also helps reduce arterial plaques and promotes blood vessel dilation. Thus, it can be highly beneficial in treating atherosclerosis, a leading cause of heart disease. Also, it reduces the inflammation in the lining of the blood vessels and keeps the arteries flexible. Studies have shown that drinking eight ounces of pomegranate juice a day, for at least three months can improve blood flow to the heart in people suffering from coronary artery disease. It can also reduce the thickening of arteries that supply blood to the brain. The antioxidant compounds present in pomegranate juice help lower blood pressure. Preliminary research shows that it helps lower systolic (the top number in a blood pressure reading) not diastolic blood pressure. In addition, they reduce platelet aggregation, thereby reducing the risk of heart attack and stroke. Pure pomegranate juice is good for diabetics as it has anti-oxidative effects on serum and macrophages. Interestingly, unlike other fruit juices, pomegranate juice does not elevate blood sugar levels, even though it contains fructose. A study found that pomegranate juice did not increase blood sugar levels in diabetics who consumed it daily for two weeks. Hence, the juice protects diabetics from vascular diseases without affecting their blood glucose, cholesterol, and triglyceride levels. Scientists believe that drinking a glass of pomegranate juice a day can prove effective in fighting arthritis naturally as it protects cartilage due to its antioxidant and anti-inflammatory properties. Researchers at Case Western Reserve University in Cleveland have found that pomegranate juice may help lower the levels of an inflammatory chemical related to the overproduction of an enzyme that is normally required for cartilage replacement but tends to wear away the cartilage when in excess. The flavonol-rich juice can help delay the onset of arthritis and reduce its severity. Plus, it has been found to help reduce disease activity and oxidative stress in patients suffering from rheumatoid arthritis. Regular intake of pomegranate juice inhibits the growth and development of cancer as it helps fight free radicals due to its high antioxidant power. For instance, drinking a glass of juice extracted from this ruby red fruit protects against the development of prostate cancer. It also inhibits breast cancer, colon cancer, lung cancer, leukemia, and other vascular changes that promote tumor growths. Its anti-cancer effects are also related to its ability to induce cancer cells to self-destruction. Research shows that it can prevent HIV transmission, too. There have been several studies that have shown that pomegranate juice helps in the treatment of erectile dysfunction. In 2007, a pilot study published in the International Journal of Impotence Research found that pomegranate juice improved erectile dysfunction in the test subjects. The researchers believe that it could be due to the potent antioxidants present in the juice. Plus, it contains compounds that boost nitric oxide levels in the body. Nitric oxide dilates the blood vessels that cause erections. Regular intake of pomegranate juice improves memory and helps prevent and slow down the progression of Alzheimer’s disease. A recent study from Evidence-Based Complementary and Alternative Medicine shows that the juice helps improve memory function by increasing blood flow to the “critical task-related” regions of the brain. Plus, the polyphenols present in this juice inhibit premature aging. Thus, the juice is great for reducing physical and mental decline related to aging. It also helps maintain radiant skin and prevents the formation of wrinkles. Like grapefruit juice, pomegranate juice may also interact with certain medications such as blood thinners, ACE inhibitors, and medications used to lower cholesterol. it may restrict the functioning of certain enzymes secreted by the liver. These enzymes are responsible for the breakdown of chemical compounds present in medications. When taking prescribed drugs for high blood pressure, intake of pomegranate juice may increase the risk of very low blood pressure. Although safe for most people, it may cause allergic reactions such as nausea, vomiting, itching, swelling, runny nose, etc. in those who are allergic to pomegranate fruit. Though pomegranate juice can help reduce wheezing in asthma patients still, they need to take the juice with caution. Excessive intake of this fruit or its juice may cause gastric problems. To derive the maximum benefits of this juice, make sure you drink freshly extracted pomegranate juice, without adding sugar (sugar adds calories and reduces the heart health benefits of the juice). You can drink two to eight ounces of fresh pomegranate juice a day.